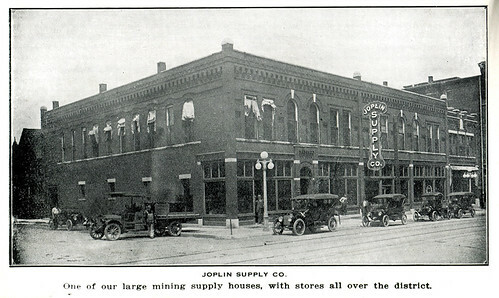 On Saturday, the Joplin Globe ran an article about the Joplin Supply Company. The one time location where later on Ford Model Ts were built within and moved within the building by large elevators. That building is now one of the historic locales receiving the renovation treatment. 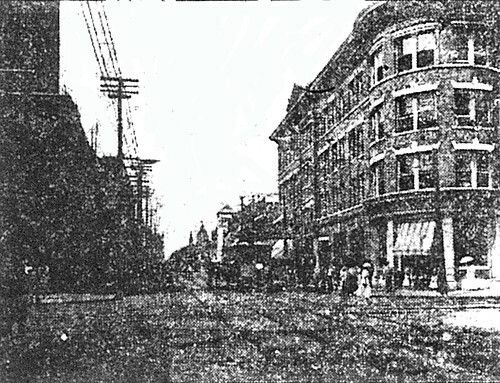 Below is a photograph of one of the earlier locations for the company on Fourth Street. The parking lot adjacent to the former Federal building and located behind the library is all one will see if they attempt to hunt down this building today. The Joplin Supply Company building at Fourth and Wall Streets. 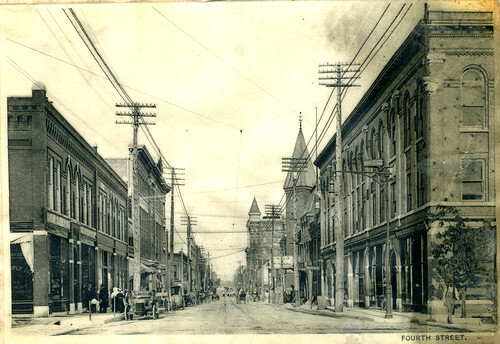 At the height of Joplin’s boom days, the intersection of Fourth and Main streets was the beating heart of the city’s commercial district. It was no coincidence that the city’s two greatest hotels, the Connor and Keystone, faced one another from opposite corners, or that Democratic party boss, Gilbert Barbee owned the House of Lords on another corner. 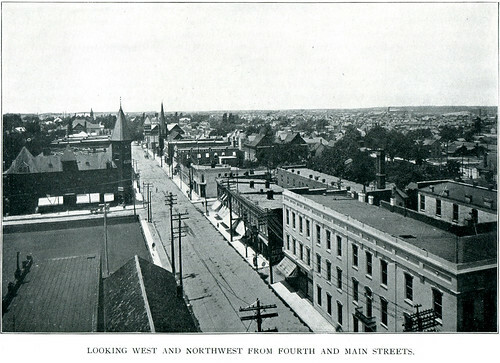 Along Fourth Street, particularly that west of Main, was prime real estate. One venturing down west Fourth Street found themselves passing the Club Theater, as well the Elks Club lodge and the home of the Miners Bank. In the next few photos, we’ll examine the change to the street over just a few years. In addition, with a nod to Leslie Simpson’s latest book, Now and Then and Again: Joplin Historic Architecture, a present day view of the street. 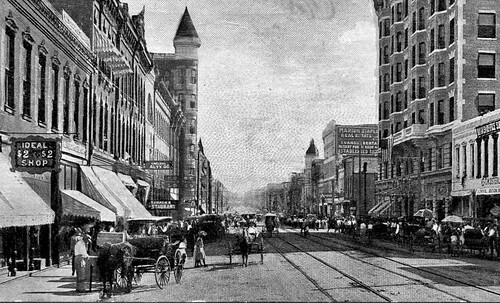 A view of Fourth Street looking east - sometime before 1906. In this first view there are several clues to time the photograph was shot. First, visible to the right is the steeple roof of the Club Theater. 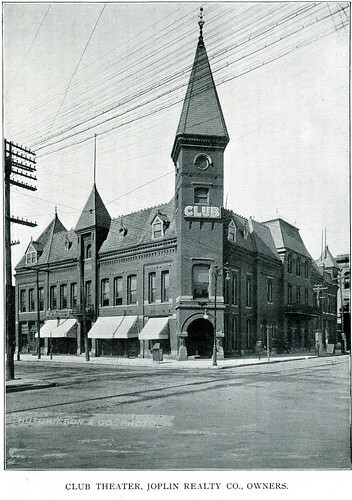 The Club Theater was completed in 1891. The conical roof further down the street marks not only the Keystone Hotel, built in 1891 and completed a year later, marks the intersection of Fourth and Main. On the left side of the street, a block down and hardly noticeable is the old Joplin Hotel. What is not in this photograph is the Connor Hotel, an eight story building that was built where our squat Joplin Hotel now stands. The Joplin Hotel was razed in 1906. As such, we know this photograph dates from before that time. Speculatively, sometime from 1891 to 1906. 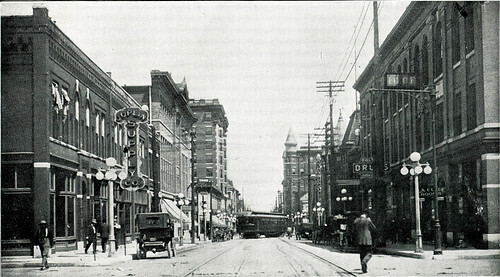 View of Fourth Street looking east sometime after 1908. In this view we have some familiar faces. 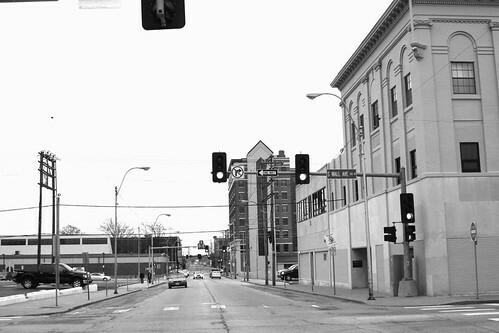 The Club Theater on the right, the Keystone down the block, and on the immediate right, the once Elks Lodge and offices of the Joplin Water Works. The main difference is now the reverse of our previous photograph. Where the old Joplin Hotel stood, now stands the Connor. Its presence lets us know that this photograph was taken after its completion in 1908. Note the change in design of the automobiles on the street and the lack of horse drawn wagons or carriages that were present in the previous view. 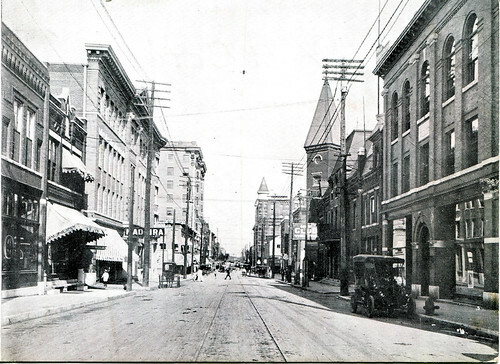 Fourth Street looking east - sometime before 1913. Our third view of Fourth Street. The Connor and the Keystone are both present. The steeple roof of the Club Theater is conspicuously absent, though you can see the roof line of the club’s western side. Incidentally, by this time, the Club Theater, despite a renovation in 1905, had lost its status as the finest theater in town to the Shubert Theater which was located several blocks down to the south. The vehicles are a little more modern and a subtle aspect is the switch from one set of trolley tracts to two. Also different, which allows us to place this photograph as more recent, is the addition of electric signs to the facades of the buildings. Now, we state that this photograph is dated as having been taken before 1913. How did we come to that number? In this case, its simply knowing your source. 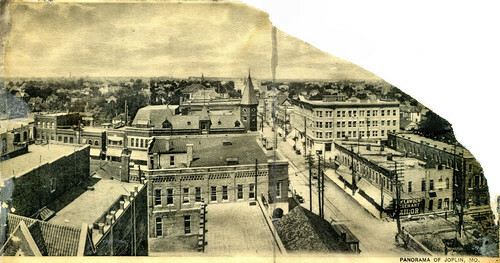 This photograph came from a booklet published in 1913 to publicize the city, which allows us to place that hard date. Fourth Street looking east - present day. If any comfort can be taken from this view of modern day Fourth Street it is that the City of Joplin has embarked on a mission to restore and recognize the city’s remaining historic buildings. A drive down Main Street reinforces the belief that while a lot has been lost, that which remains will be saved. Sources: Historic Joplin collection, Missouri Digital Heritage.